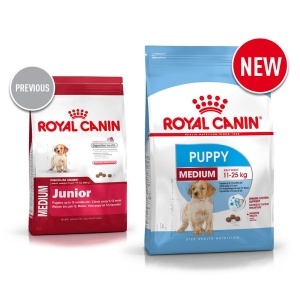 Royal Canin Medium Puppy dog food helps maintain an ideal body shape in medium size puppies aged 2 months to 12 months. Growth is an essential stage in any dog’s life. It is the time for big changes, discoveries and new encounters. 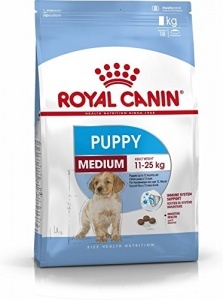 During this exciting period, the immune system of your puppy develops gradually. Royal Canin Medium Puppy helps support your puppy’s natural defences, thanks particularly to a patented formulation of antioxidants including vitamin E.
Medium Puppy combines nutrients with high quality protein (L.I.P. *) and prebiotics (FOS) to support digestive health and balance of intestinal flora. This contributes to good stool quality. 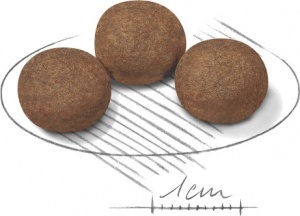 *Protein selected for its very high digestibility. Dehydrated poultry protein, maize, animal fats, beet pulp, vegetable protein isolate*, maize gluten, dehydrated pork protein*, rice, wheat flour, hydrolysed animal proteins, wheat, maize flour, minerals, fish oil, soya oil, yeasts and parts thereof, fructo-oligo-saccharides (0,34%), hydrolysed yeast (source of manno-oligo-saccharides), yeasts extracts (source of betaglucans), marigold extract (source of lutein). Crude ash: 8%. Crude fibre: 1.7%. Crude oil fats: 20%. Moisture: 0%. Protein: 32%.